Leafcutting bees are important native pollinators of North America. They use cut leaves to construct nests in cavities (mostly in rotting wood). They create multiple cells in the nest, each with a single larva and pollen for the larva to eat. Leafcutting bees are important pollinators of wildflowers, fruits, vegetables and other crops. Some leafcutting bees, Osmia spp. are even used as commercial pollinators (like honey bees) in crops such as alfalfa and blueberries. Figure 1. A leafcutting bee, Megachile sp. Photograph by David Almquist and David Serrano, University of Florida. Leafcutting bees are found throughout the world and are common in North America. In Florida there are approximately 63 different species (plus five subspecies) within seven genera of leafcutter bees: Ashmeadiella, Heriades, Hoplitis, Coelioxys, Lithurgus, Megachile, and Osmia. Most leafcutting bees are moderately-sized (around the size of a honey bee, ranging from 5 mm to 24 mm), stout-bodied, black bees. 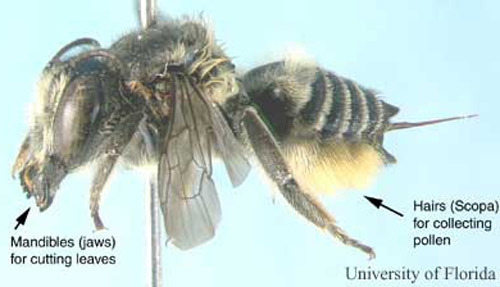 The females, except the parasitic Coelioxys, carry pollen on hairs on the underside of the abdomen rather than on the hind legs like other bees. When a bee is carrying pollen, the underside of the abdomen appears light yellow to deep gold in color. Figure 2. Side view of a female leafcutting bee, Megachile medica Cresson. Note the pollen- carrying hairs on the underside of the abdomen. Photograph by David Serrano, University of Florida. Leafcutting bees, as their name implies, use 0.25 to 0.5 inch circular pieces of leaves they neatly cut from plants to construct nests. They construct cigar-like nests that contain several cells. Each cell contains a ball or loaf of stored pollen and a single egg. Therefore, each cell will produce a single bee. Leafcutting bees construct these nests in soil, in holes (usually made by other insects) in wood, and in plant stems. A diversity of cavities, such as shells of dead snails, holes in concrete walls (like those produced for hurricane shutters) and other holes in man-made objects are used as nesting sites. Figure 3. 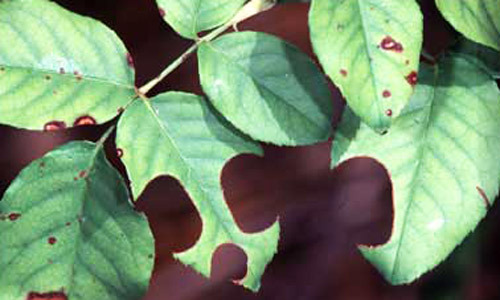 Typical leaf damage caused by leafcutting bees, Megachile spp. The bees use the leaf pieces to construct nests. Photograph by L.J. Buss, University of Florida. Figure 4. Nest of leafcutting bee pulled out of a cavity such as a hole in wood. This nest contains several cells; each cell will produce one adult leafcutting bee. Photograph by J.L. Castner, University of Florida. Most leafcutter bees overwinter in these nests as newly formed adults. In the following spring these adults chew their way out of the nest. Leafcutters are solitary bees and do not live in large groups or colonies like honey bees. Leafcutters do not aggressively defend nesting areas like honey or bumble bees. Their sting has been described as far less painful than that of a honey bee. Leafcutting bees will only sting if handled and therefore are not a stinging danger to people. Leafcutting bees are important pollinators of many wildflowers. They also pollinate fruits and vegetables and are used by commercial growers to pollinate blueberries, onions, carrots and alfalfa. Leafcutting bees use the leaves of almost any broadleaf deciduous plant to construct their nests. Some species of leafcutting bees use petals and resin in addition to leaves. These bees will commonly cut circles from ornamental plants such as roses, azaleas, ash, redbud, bougainvillea and other plants with thin smooth leaves. This decreases the aesthetic value of these plants. Many parasitoids attack the nests of leafcutting bees, including flies, wasps (Chrysididae, Mutillidae) and beetles (Rhipiphoridae, Meloidae and Cleridae). 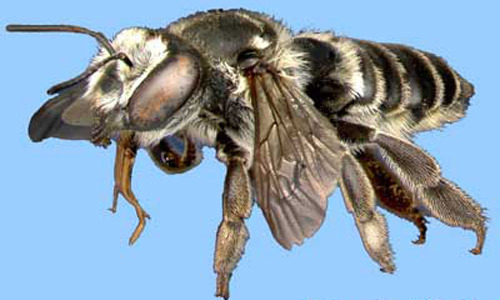 The Coelioxys, a genus within the leafcutting bee family, are kleptoparasites (they lay their eggs in the nests of other leafcutter bees and the young "steal" all of the stored pollen). Ants, such as Crematogaster spp., have been known to attack leafcutter bee nests. Leafcutting bees can be considered a pest because of leaf cutting on ornamental plants. Although the cutting can destroy the aesthetics, it rarely harms the plant. Since leafcutting bees do not feed on the leaves they cut, insecticides are usually ineffective for preventing leaf cutting. Placing physical barriers such as cheesecloth on susceptible plants is a successful solution to preventing damage. These barriers should be used when leaf cutting is first observed. Eliminating nesting sites can reduce the number of leafcutting bees in your area. Small diameter holes (size of a nickel or smaller) in soft, rotting wood are an ideal nesting site for these bees. Holes plugged or stuffed with green or brown leaves are a sign that a leafcutter bee is nesting in that hole. Some leafcutter bees will nest in thick-stemmed plants (such as roses and bamboo) with hollowed openings. You can prevent nesting in rose canes by sealing pruned ends with wax (sealing or candle), thumbtacks, wooden dowels or white glue (a drop or two will do). Leavengood Jr JM, Serrano D. 2005. A distributional checklist of the leaf-cutting bees [Hymenoptera: Megachilidae] of Florida. Insecta Mundi 19: 172-176. Mitchell TB. 1962. Bees of the eastern United States (vol. II). Technical Bulletin Number 152. The North Carolina Agricultural Experiment Station. Michener CD. 2000. The bees of the world. Johns Hopkins University Press. Preston-Mafham K, Preston-Mafham R. 2000. The natural world of bugs and insects. PRC Publishing. London. Publication Date: January 2005. Latest revision: July 2014. Reviewed: December 2017.